Hypnobabies Mom Sleeps Through Some Pressure Waves Right Up Until Baby is Born! Baby Annaleah Nancy was born Thursday May 10th, 2012 at 5:38am. 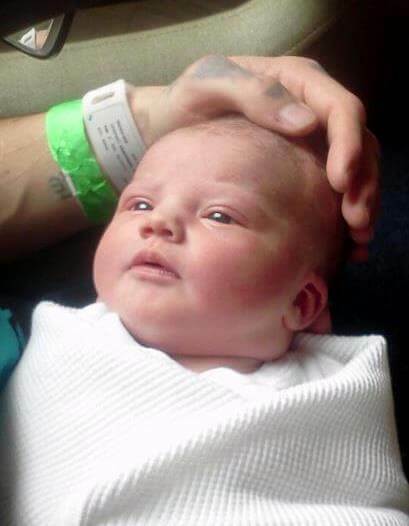 She is absolutely perfect, weighing 7lbs 10oz at birth, and 20in long. Our doctor even called her, “the perfect specimen”. 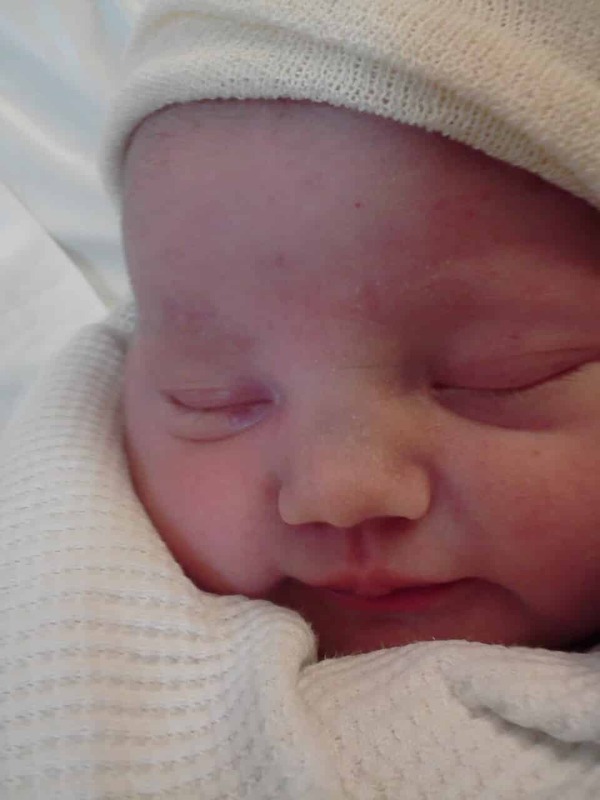 She is a truly beautiful baby, with dark brown hair and blue eyes, and was totally worth the 25 hours of birthing time it took for her to arrive. My pressure waves started Wednesday May 9th at 4:30am. They started out strong and fast, 2-3 minutes apart, at a minute long! They did slow down after the first few, but stayed mostly at 2-5minutes apart the entire time. I had very few that were a bit longer. So it was definitely tiring. The first 12 hours were amazing. I used the Hypnobabies techniques, and they worked. I went into my doctor’s appointment at 11:30am Wednesday, smiled and said, “I think baby is on the way.” She checked and I was 3cm and 80% effaced. She suggeste we go home, have lunch, and go to the hospital. I’d wanted to wait to be further along, but with testing gbs positive, also wanted to be sure I had enough time for antibiotics. We got to the hospital at 2:30pm. So far, I still felt great. I was talking and smiling through every pressure wave. The nurses kept looking at the monitor, and asking, “Don’t you feel that?” They also told me that when my doctor called to tell them we were coming in, she told them, I’d probably seem like nothing was happening because I’m usually pretty calm and quiet. Shortly after we arrived, one of the nurses checked my progress. She estimated me to be at 7cm already! It felt amazing to hear I’d gone so far, and had not even the slightest bit of discomfort. Unfortunately, my doctor arrived shortly after, and a bit later, had to reluctantly tell us I was not at 7cm, but at 4cm. That set me back a bit. I’d been really calm and relaxed, and feeling positive about everything. Suddenly I felt how slow things were going. I started feeling more of the waves now too. I did manage to get refocused, but it was hard after that to be as positive as I had been. I was comfortable most of the night, though I had to spend way too much time on the monitor, because baby girl kept moving. We walked the halls some, slow danced, and I spent some time on the ball to try to get things moving. Sometime in the night I started having some back pressure. At that point I started using the shower. It actually helped a lot. I wish our shower at home was that nice! Mostly I tried to stay relaxed and patient. I knew baby would come in her own time. Around 3:30am Thursday, I lost my mucus plug. I was now at 7cm. Starting at this point, my waves became very powerful and intense. I also started having uncontrollable shaking, which lasted until after baby’s birth. I kept repeating to myself that, “the stronger and more powerful my pressure waves feel, the closer I am to holding our baby girl.” It worked, as despite the intensity I managed to be able to sleep through some waves right up until it was time for baby to be born. About an hour later, maybe a bit less, my water broke. I was still at 7, but progressed very quickly. I had a sudden intense urge to push in less than half an hour. In fact, my body started trying to push on it’s own. So they checked me again, and I was between 8 and 9 cm, but still had a water bag. My water had definitely broken, so this was strange. They called for my doctor because regardless, things were going quick now! A few minutes later, my doctor got to the room. She checked, and there was a second bag of completely intact waters. She asked if I felt like I could push with my next pressure wave. I told her, “I’ve been trying not to push for the last half hour!” So on the next one, I pushed and my second bag of waters broke with an explosive gush. I felt baby’s head drop immediately, and was told to keep pushing. I used the ah breathing techniques in the Hypnobabies course to push. I could hear one nurse telling me to hold my breath and push, but I just stayed in my bubble of peace and kept doing what I knew was right for me and baby. Our doctor never once gave me “how to” instructions. She patiently sat on the edge of the bed, and stayed positive and encouraging for us. I did make some yelling sounds with pushing, which surprised me. I’m usually very quiet, but it felt good to make a bit of noise. After a few pushes, I tearfully declared I couldn’t do it because I was too tired and wanted to sleep. My doctor knew just how to motivate me though. She suggested I reach down and feel baby’s head, which was crowning. So I did, and that was enough to give me that last bit of energy needed. I said, “Come on out now baby girl”, then I moved from my side to a more upright, not quite a full squat position. I wanted to be able to see her be born, and have gravity working for us as well. In just a few pushes more her head was out. I moved one leg the slightest bit, and out slid our baby girl. She had a perfect shaped head, and wasn’t the least bit wrinkled. Along with two bags of waters, she’d had a larger than normal placenta to work with. I will never forget what it was like to both feel and see her being born, or how it felt to first hold her in my arms. The way she looked at me and her Daddy so lovingly, is permanently etched in my mind. She didn’t cry at all. She just looked around the room and smiled. Her Daddy touched her hand, and she immediately grabbed onto his finger. It was the most intense, most powerful, most beautiful experience of our lives. I experienced so many powerful feelings and emotions during my birthing time. I laughed, I cried, I sang, I even yelled a bit. Each one felt good. By the end, I was exhausted. I’d had 25 hours of frequent, fairly intense pressure waves. I am so thankful we decided to take the Hypnobabies course. It really did help me to get through such a long birthing time in an overall easy and comfortable way. I remember telling Jeff, as I pushed her out, that this might be our only baby. Truth is, I changed my mind about that the minute she was born. I will never forget the way she looked at me, so happy, loving, and peaceful. That alone made it all worth while. If we do have another, we will be using Hypnobabies for that birth as well. This is very inspiring. As hormonal as I am being pregnant again, I even got teary eyed at the end. She looks amazing, my daughter’s face was a bit squashed and my husband asked if her nose would stay like that! HAHA! Great post, and I will have to check out this Hypnobabies technique as I want to try for an unmedicated birth this time around. What a wonderful story! Thank you so much for sharing! I’m currently 32 weeks with our first baby, and am studying the hypnobabies home study course. Reading stories like yours only reinforces everything I’m learning, and makes me feel so much more confident! Thank you, and congratulations to you and your family!